The Bubble Project has been taking back our streets since 2005. 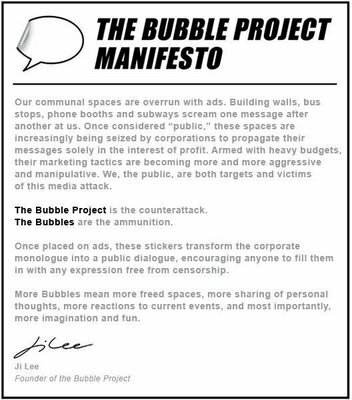 Today, Wooster Collective announced, "..the second book in our "Books We Love" series is Ji Lee's Talk Back: The Bubble Project which came out from Mark Batty publisher in 2006." In the posting, Wooster includes Ji Lee's Manifesto which is a very concise argument for the need for open participation in our public discourse. Very insightful.